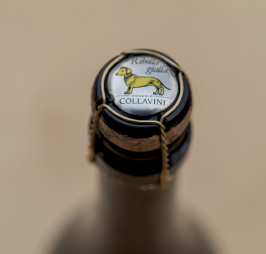 At the end of the 1970’s, in order to lay the foundation for a new sparkling wine, Manlio Collavini decided to allocate 4.5 hectares of his vineyards to an ancient and local grape variety called Ribolla Gialla. According to professor Attilio Scienza, “the Ribolla Gialla is the easternmost grape variety of Friuli Venezia Giulia and was brought to Italy for the first time by the Roman legions, which used to travel from Pannonia to Gaul passing through the Friulian region”. The final result of Manlio’s work is a new Ribolla Gialla Brut obtained from a reinterpretation of the traditional sparkling wine-making method. The so-called “Collavini Method”, in fact, originated by integrating together the best advantages of the classic techniques and the Martinotti-Charmant process. In the following years, 11 more hectares of Ribolla Gialla started to be cultivated on this terroir, which were deemed to be ideal thanks to the marly soil and gentle north-west breeze. Only the great harmony between these key factors gives us the chance to produce Ribolla Gialla Brut, as a well-balanced and high-quality sparkling wine.